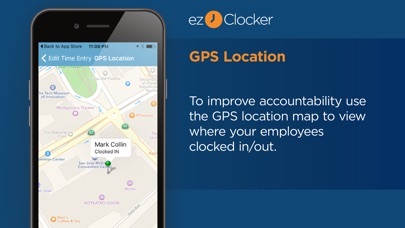 ezClocker is a simple to use employee time tracking and shift scheduling tool with GPS map to verify clock in and out locations. 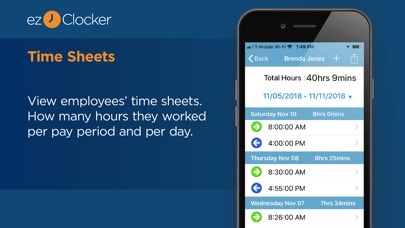 Ideal for any business with remote employees or those looking to replace the traditional time card system with something more modern and streamlined, ezClocker lets you provide your employees with a time clock on their mobile device! ***If you’re a freelancer or you want an app that allows you to track your personal work hours, download ezClocker Personal! *** ezClocker makes your life easier by allowing you to modify and review timesheets, export data for payroll, create shift schedules for employees and much more! Simple and convenient to use, now you can focus more of your time on your business and customers, and less time managing your employees! ------------------------------------------------ Why businesses LOVE ezClocker! ------------------------------------------------ • Easy to use, employees can clock in with a tap of a button using their mobile phone. 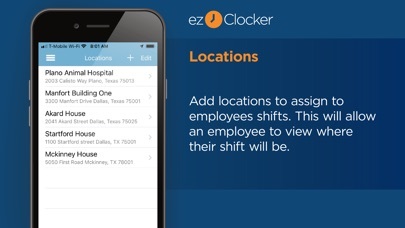 • Built-in GPS map shows where employees clock in and out (does not track their movements). • Affordable! monthly subscription plans start at $9.99/month covering up to 15 employees with no hidden fees. • Create shift schedules using the app or website in real-time. 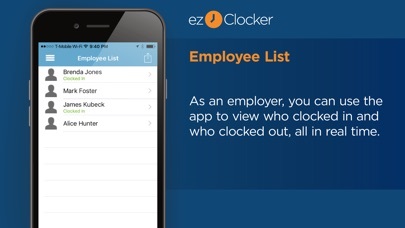 • All data is stored in the secure ezClocker Cloud – 24/7 access via the website or app. • Review & modify employee time sheets. • Export data to a .csv / Excel file and email it to yourself or your accountant in seconds. • Streamline and modernize the traditional time card system. ------------------------------------------------ ezClocker Business is perfect for… ------------------------------------------------ •	Construction companies •	Janitorial businesses •	Contractors •	Landscape businesses •	Home Healthcare •	Sales departments •	Physician offices … and so much more! In-App Purchases: After your 30 days free trial, if you have more than 1 employee you will need to purchase a monthly subscription that will get automatically renewed every month. Monthly subscriptions start at $9.99 based on the number of employees you have: -Up to 15 Employees for $9.99 -Up to 30 Employees for $24.99 -Up to 100 Employees for $49.99 Automatic Renewal Feature: Your subscription will be charged to your iTunes Account at confirmation of purchase and will automatically renew unless auto-renew is turned off at least 24-hours before the end of the current period. Subscribers can manage their subscription including turning off auto-renewal by visiting their iTunes Account Settings after purchase. Please visit https://ezclocker.com/public/privacy.html to learn more about how we protect your privacy and https://ezclocker.com/public/ezclocker_terms_of_service.html for our terms of service. 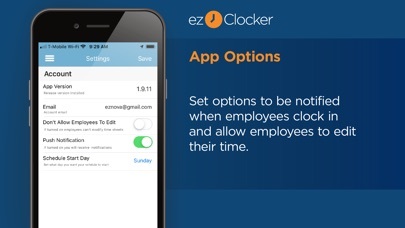 DOWNLOAD EZCLOCKER TODAY – THE SIMPLE, STREAMLINED TIME MANAGEMENT TOOL! 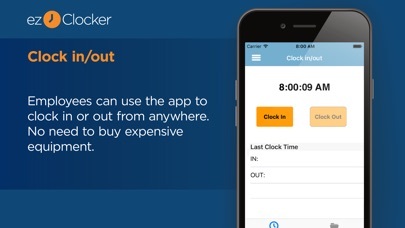 This app makes it so easy to clock in and out. This app is great for companies that do not have time clocks. 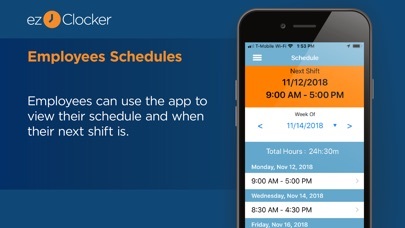 It’s a little hard to figure out how to do your work schedules but once you learn it this app is great I love how it shows the complete times of clocking out in minutes, and how it is so easy to send your time sheet in by email this is a wonderful app. The app does freeze once in a while which is why I didn’t give it 5 stars. Otherwise it is perfect for keeping track of my employees time in my small business!! Has worked well for my small business. Happy to say there has been no glitches or problems with the app experienced. We have been using ezClocker for the last year or so. All has worked good. Began using this app about a month ago for the 8 private caregivers caring for my boss. Saves me so much time calculating hours, seeing who’s working, etc. The only downside is trying to edit a worker that forgot clock out. Difficult to do on a device, have found I have to be in the computer. Especially if they didn’t clock in or out at all. But overall it has made my job so much easier! After upgrading my phone to the 19 the format on the app isn’t working. Uninstalling and downloading again. I hope this fixes the bug. It does what it says it does. One of our desires for this app would be to see the notes for the employer to see them as well as the employee. Great app for small business! We have been using this app for about a year to run our hardwood flooring company with 7 employees. Positives: - Accurate and helpful - Great customer service - GPS feature is necessary as we have some guys go straight to the job site Negatives/Room for Improvement: -GPS is not totally accurate - Wish it had a way to block clocking (guys that show up 30 minutes early and sit in their car) - would like to be able to restrict clocking in before a certain time - I guess we could have worse problems than employees showed no up early - Should have a break and/or lunch button - When notifications are sent to employer that an employee is clocking, wish it showed the location too bc it’s a pain to go in and look at the coordinates each time - Wish there was a way for the employee to send a message directly to the employer. We don’t get notifications when an employee leaves a note Overall, very useful for tracking hours for remote locations.